For nearly 50 years, social equity has been an integral component of public administration theory and practice. At the first Minnowbrook Conference in 1968, social equity became the third pillar of public administration, alongside economy and efficiency. Since that time, many scholars have conducted research with an emphasis on explaining what social equity is and empirically tested the extent of equity’s presence in public sector organizations. The redressing of injustices and remediation of damages that were previously incurred, fully incorporating all segments of the community in the political process and establishing measures to prevent future inequities from occurring. While these definitions offer some guidance in understanding social equity, a universal conception of the term is still not present within the field. 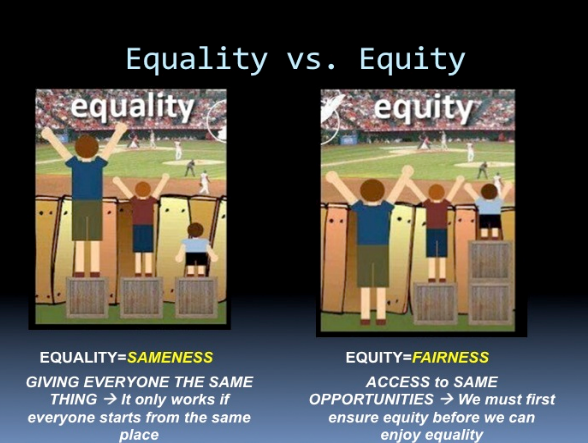 As an example, equality and equity are often used interchangeably. These two concepts are related, but they represent differing priorities and have vastly different impacts. 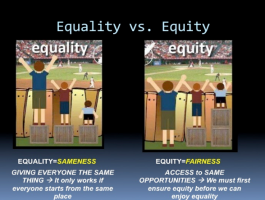 As depicted in the image to the left, an equality perspective suggests everyone should get the same amount. This approach is beneficial only when everyone has started from the same place. Unfortunately, in countless societies across the globe, residents do not all start from the same place. For instance, the effects of Apartheid in South Africa remain prominent for Black and Coloured citizens who were on the receiving end of this discriminatory policy. As a result, the country remains highly segregated with many Black and Coloured residents relegated to select townships, some of whom have only recently gained access to stable electricity and running water. In this instance, offering the same services to residents living in Black townships as Afrikaans (the White social class) living in the more affluent communities does little to reduce the disparities that exist between social groups. Nor does offering the same amenities address the unequal access to services that strengthen one’s ability to be socially mobile. Those living in shanty towns are no less deserving; however, apartheid, as a public policy, created inequities in accessing education, employment and other public services that created barriers for certain segments of the population. An approach grounded within a social equity perspective is not focused on distributive justice, but rather seeks to offer what is needed to create a level playing field. Iris Young argues that justice is not just the redistribution of goods but also is offering access to the institutional conditions necessary for the development and exercise of individual capacities and collective communication and cooperation. The decisionmaking framework, choice points, is an administrative approach that can be used to address inequities, advance equity and reduce the effects of bias. Choice points represent the decisionmaking opportunities that shape outcomes. Public administrators are tasked with making decisions that impact the lives of residents on a daily basis. Oftentimes unknowingly, administrators make decisions that have inequitable outcomes. As the cumulative sum of many small decisions can be as significant as the impacts of big decisions, an unawareness of choice points can negatively impact equity within communities. Likened to a fork in a road, choice points are where administrators—while at a decisionmaking cross road—can choose one of a number of decisions. Each decision has its own set of outcomes, with varying degrees of equity. When administrators are more aware of choice points and understand the associated impacts of their decisions, they may be more likely to make decisions that create equitable outcomes. What are the decisionmaking points that affect outcomes? What decisions or actions may be reinforcing the status quo, implicit bias and inequities? What alternative action options could produce different outcomes? Which actions will best advance equity and inclusion? What reminders, supports and accountability systems can be structured into routine practices to keep equity as a high priority? The consciousness associated with decisionmaking and all of its subsequent consequences can elevate social equity into the forefront of administrative practices and behaviors. The behaviors of individuals within public organizations shape an organization’s culture and practices. Incidentally, organizations promote and facilitate equity through effective leadership and management. In this regard, public bureaucracies and administrators move from aspirations and theoretical ideas of justice, fairness and equity toward making these concepts real and achievable for all constituents served.